Having the conviction to say "I surrender" to God, and then actually do surrender, by obeying Him every day of our lives, will get us to heaven. The Redemption Love Story typifies our obedience to Jesus. When Ruth surrendered herself to Boaz, she was redeemed by him, becoming his wife, and over time the great great great great ....... grandmother of Jesus Christ (lineage of Jesus - Matthew 1:1-16). And Naomi said unto her daughter in law, Blessed be he of the LORD, who hath not left off his kindness to the living and to the dead. And Naomi said unto her, The man is near of kin unto us, one of our next kinsmen (Ruth 2:20). In fact Naomi does an about face, her faith growing immeasurably, she becomes Ruth’s teacher of how to be redeemed. Naomi, with her renewed faith typifies the Church today. It is our responsibility to teach the lost as Jesus commanded in Matthew 28:19. Naomi knows what Boaz’s role is in the redemption process and gives her exact instructions on what she should say and do (Ruth 3: 1-5). Naomi’s instructions, i.e. her teaching, were very important, but of greater importance was Ruth’s willingness to follow through with the whole plan. If she didn’t surrender, everything else would be in vain. In the same manner today the church acts as teacher to the lost soul who desires salvation. The church knows about the unsaved, and how the person must approach God and the Redeemer’s role in redemption. Once the Church teaches this to the unsaved, then the burden of action shifts to the sinner. To receive salvation, the sinner must believe and obey the gospel of Jesus Christ. The door only has one doorknob and that’s the side of the person seeking redemption. 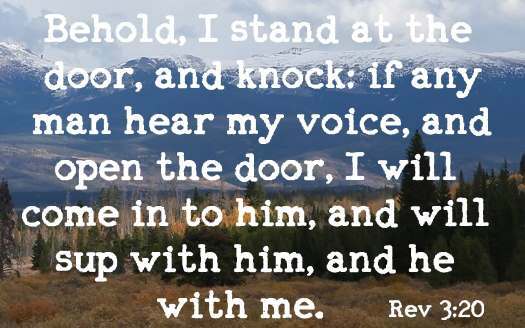 Opening that door knob, completely surrendering to Jesus will allow anyone who is not saved to be born again.